This is the fourth and final week of a series we are calling, “More than All Others.” In the reading from Mark, Jesus speaking about a poor widow who gave only two coins to the offertory, said she gave more than all others. It is a great honor and respect from Jesus and it is the approach we should have in all we do for the kingdom of God. It is not an approach to a competition for the Kingdom of God, it is merely a goal for each of us. In the first week we looked at love. How do we love? This is the command of Jesus when asked which commandment is first. Jesus replies you shall love the Lord your God with all your heart, soul, mind, strength and love your neighbor as yourself. We looked at how it is possible to love each other more than all others and how it is possible for God to love us more than all others. The second week we looked at the readings with an eye toward giving. We see stories of widows, who had nothing giving all they have because of their faith. Widows were very dependent on some male member of their husband’s family or even their own son to be able to survive. Some Rabbis shared a biblical view that a woman only has two proper roles, an unmarried virgin in her father’s house, or a child producing wife in her husband’s or her husbands’ family’s home. God uses widow’s as his messengers. Last week the readings took a look at the pivotal event of the Christian message, resurrection. We didn’t read about the resurrection of Jesus on Easter morning, but about the resurrection of each one of us. We all have the chance to rise, to live fully. The readings had a dark nature to them, indicating one is coming from the clouds and it will be the end of time. But it really is good news because we are not living where we are meant to live. Our home is with God and we are meant to arise and be with God. We looked at how we will rise more than all others. This week we celebrate the end of the church year and look at how Jesus might come and make judgement. The messages look at one coming in a cloud, as the son of man, and the first and the last, it also has Jesus telling one who is judging him he has come to testify to the truth and all who belong to truth listens to Jesus. This week we want to look at what it means to live in the truth. How being a follower of Jesus holds us to a higher standard, and even small exaggerations are cracks in our integrity that will cause us to slip away from truth and the voice of Jesus. We want to be followers who know truth more than all others. 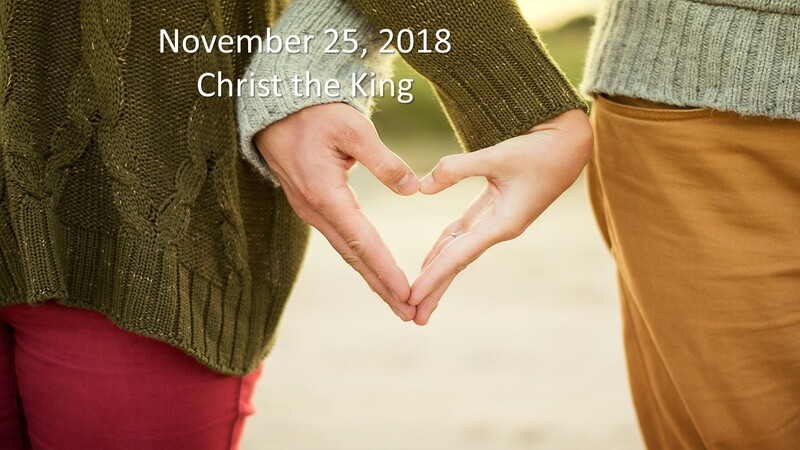 The readings this week are from the Lectionary for Our Lord Jesus Christ, King of the Universe a feast celebrating the awesomeness of Jesus, the one who leads the world. The readings are; Daniel 7:13-14; Psalms 93:1, 1-2, 5; Revelations 1:5-8 and John 18:33b-37. Each of these readings gives witness to truth, the living word God has provided so that we may endure in truth. First we will look at each reading and then we will take a look at the truth in context of the readings and our lives. We don’t want to simply live truth, but how when we live truth we do so more than all others. The first reading is from Daniel again this week, the prophet is sharing a vision that seems to have come to him in a dream. It is about the “one like a Son of man coming” which Jesus spoke about in the gospels, claiming himself as the son of man. The scene is about judgement, glory and giving him dominion over everything for all time. When we say in the Creed, that Jesus sits at the right hand of the Father, we are identifying this dominion, that everlasting kingship that has been given from the Father to the Son. In the gospels of Matthew (16:27-28) Jesus speaks about coming in the Father’s glory repaying everyone for their conduct. Jesus the Word of God is the Truth, and we get a glimpse of the Truth that life is rewarded based on conduct. What we do matters. The second reading from Revelations calls Jesus the faithful witness, firstborn of the dead and ruler of all the earth. Speaking of Jesus as a faithful witness is claiming he is Truth, he has come to reveal the Father to us, he has come to fulfill the promises of the Father and he has witnessed the Father, he is God’s Word becoming human. Firstborn of the dead puts Jesus as the first to ever die and return to life, God’s plan for all of us. Ruler of the earth declares Jesus is the one who is in charge, before him evil had a certain dominion over the earth, but Jesus defeated evil and now he has dominion. This reading again has Jesus coming in a cloud, a similar vision to the one we read in Daniel but this time it is John’s vision. John says everyone will see him! By sharing a similar vision as was read in Daniel this reading further proves the Truth despite hundreds of years of separation in the visions. Jesus is the Word revealed, the Truth for all to believe. In the gospel Mark we have a scene of Jesus before Pilate being questioned about who he is and what his purpose has been. Jesus tells Pilate his kingdom is not of this world, that he was born to lead the people of the world, to testify to truth, and everyone who belongs to truth listens to the voice of Jesus. This is what Jesus kingship really is, his kingdom is the Kingdom of Truth. Christ reigns over those who practice the truth revealed by him, essentially the Father loves the world. Jesus became human to make the truth known, to help humans understand and accept it. So those who accept Jesus, his dominion, rule, and authority, will find Jesus a watchful leader over them through all eternity. We are looking at these three readings from the view that Jesus is Truth, he came to reveal the Truth and to demonstrate all we have heard is Truth. There are many ways that we see the Truth of God in the life of Jesus. Understanding God has a plan for the salvation of humanity, we see Jesus as the incarnation of the Truth. Knowing God had a plan to reveal himself, we see in Jesus that God becomes more approachable, more relatable to each of us. We also see that Jesus is trying to draw all people to himself so that we could be in communion with him and the Father. The Truth is God wants us to know that Jesus came from him, that Jesus has dominion over all the world so there is no reason to fear and that Jesus’ Kingdom of Truth is a place he wants all of us to live. What do we mean when we say Jesus is the Truth? We must start with God’s word. God through the years has revealed a plan that will allow him to bring all people to salvation. This story began with a chosen nation of people, who had prophets and leaders who listened to God and shared what they heard with the people. Much of this has been written down and we have it in the form of the old covenant between God and Israel. It promises a Messiah who will save. We then see the figure Jesus who came down from heaven to reveal the Father to all who would hear. Jesus makes God very relatable by sharing that he is the Son of the Father. He tells that the Father has sent him into the world to reveal the Truth and to make things known. Jesus is also the instrument of the Father’s salvation for all humanity. God sent his only Son so that the world may be saved. God’s plan from the beginning. Finally Jesus is the Truth because he demonstrates through word and deed that everything that the Father promised is proven to be true. God is a Father who keeps his promises and this is the truth. We have that beautiful poetry that opens the Gospel of John; “In the beginning was the Word, and the Word was with God and the Word was God.” (1:1) The word of God has been spoken into the universe, it is told through the agents of God and it is heard first by a nation of believers and then any who would accept the word. This word comes into the world and it is the Truth. The word goes on to demonstrate truthfulness and proof that God keeps his promises. If anything in the word is not true than it cannot be called the truth. Truth is truth and cannot be watered down or stretched, for if it is, then it is weakened and not trusted. I have a terrific grandson, Colin who I get to have some one on one time with every once in a while. We’ll do things together, share a meal, watch a movie, look at books. These meetings between us are a blessing for me and they are opportunities to learn about him. One time we were together and he was telling me about a school classmate. He was sharing what this classmate was like in class, some of the things he had done, how he treats others and what kind of friend this classmate had become. It was not all favorable. It was as if he was wondering why this classmate did the things he did. What were his motivations? We talked about the classmate for a while and I offered my opinion about what might be happening and we moved on to other topics. Later, when we were going home he asked me an interesting question about truth; why did I believe him about the classmate? How did I know he was telling the truth? It is a great question. How do we know the truth? For Colin I responded by saying he and I had a history and that I always found him to be truthful, he did not exaggerate, or tell falsehoods and that when he shares things he does so without any personal motives embellishing the story in a particular direction. But, if he had been someone whose words are proven sometimes inaccurate or false than that trust would slowly fade and he wouldn’t be listened to as someone speaking the truth. Truth is something we are all judged for by others. If we tell a story and embellish it a little to make it sound more exciting, we lose a little of the truth. Losing a little truth may not sound like much but as the truth fades in little things, then truth in all things tends to crack and risks fading away. We have to guard against these kind of distortions, especially when what we are speaking about is very important. As Christians, all we say about Jesus and God should be regarded with this in mind. The truth about Jesus helps to make his truth spread and be accepted by others. There is no need to express God’s Word in anything other than truthful explanation. It is very important that others hear and believe. We have a God who gave his word and then fulfilled the promises of that word. We should not lose sight of this fact. Jesus came to fulfill the Truth, that all God had spoken would be accomplished as planned. If we Christians are trying to have Christ as our King we must be authentic and first let him rule over our hearts. we must love. If we let Christ rule in our soul we will not become authoritarian, rather we love and will serve others. It is by our service that we truly make Christ known and loved, it is how we come to know and love him for ourselves. It is by our giving, our generosity that others will come to know us as followers of Jesus and therefore members of the Kingdom of Truth. The more we are able to give for others, the more the Truth Jesus came to share will be revealed. We are also members of the Kingdom of Truth when we live to rise, to accept that Jesus came to reveal a new covenant one where we will die and rise as He did, the firstborn of the dead. When we live to rise we are saying to those who see us that we do accept the Truth and believe our life we continue in a new Kingdom, the Kingdom of truth. We have looked at how we would be more than all others over these past four weeks. We looked into what it takes to be more loving than all others, how to be more giving that all others, how to ready ourselves to rise more than all others and today how to live the truth more than all others. These four weeks go together nicely, to love, give, rise and share truth. In the context of our discipleship we want Jesus to say we are more than all others, as he did for the widow who gave two small coins to the offertory. Jesus’ opinion of us matters, it should matter to us as disciples, but more importantly is should matter as others see us and judge Jesus. If we as disciples do not live more than all others in the eyes of Jesus we could be letting Jesus down. Certainly we will be giving those who see us a reason not to accept Jesus Kingdom of Truth. It is important to be seen as someone who lives as Jesus did, then others seeing us live more than all others may want to know Jesus too. So when you love, exaggerate your love, when you give exaggerate your giving, when you work to rise exaggerate your rising, but in the end let your word be the truth, no more and no less. After all it is not you who are Truth, it is Jesus.